I am doing research for quite a long time now to clear up the continued misunderstanding that the town of Middelburg in the Netherlands was shelled by naval ships (such as “The Warspite” etc) off Westkapelle in November 1944. This mistake is even repeated in the official war history of the province Zeeland. 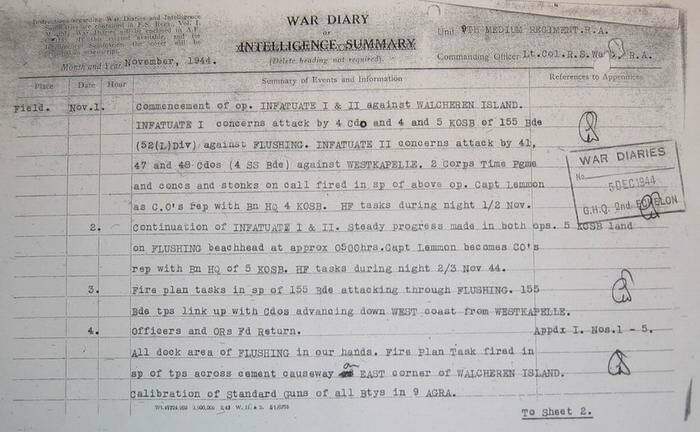 The warships, however, only bombarded the coastline from Zoutelande to Domburg, firing from about 08.15 to about 16.00 hours on the 1st of November 1944, the first day of Operations Infatuate 1 and 2. They then went back to England! This misunderstanding, I think, originated during the Middelburg barrage from a rumor that the fire came from those ships .. The rumor immediately acquired its own life and was eventualy accepted as the truth and official history. Since then no one has done any proper research into the matter, subsequently the error has been copied over the years. It has been clear for a long time that the warships went back to England during the afternoon of the 1st of November 1944, while the allied artillery started that evening and went on until the 6th of November 1944! 5th Canadian Field Regiment [9th AGRA?] and the British (52nd Lowland Division) 79th, 80th, and 186th Field Regiments. All were armed 25 ponder guns. 3rd and 4th Medium Regiments R.C.A (Royal Canadian Artillery) 2nd [Army Group Royal Artillery] AGRA and 9th, 10th, 11th, 15th and 107th Regiments R.A. (Royal Artillery)9th AGRA. 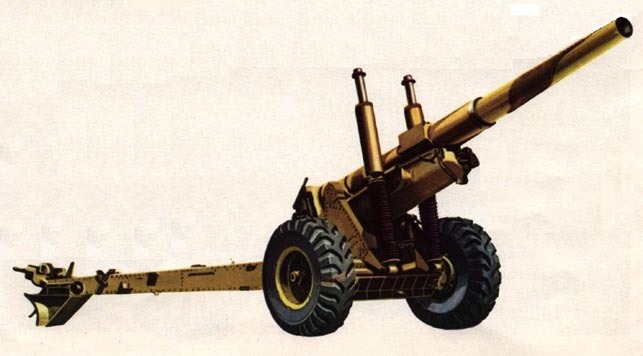 All were armed with 5.5 inch howitzers. I do believe the whole fire-support operation was under command of Brigadier-General Lionel Bryan Douglas Burns, commander of R. A. 52nd Lowland Infantry Division (Burnforce) and Brig.-Gen. A Bruce Matthews R.A. for the Breskens-pocket. I have read all the War Diaries of those regiments but no targets or coordinates were given. 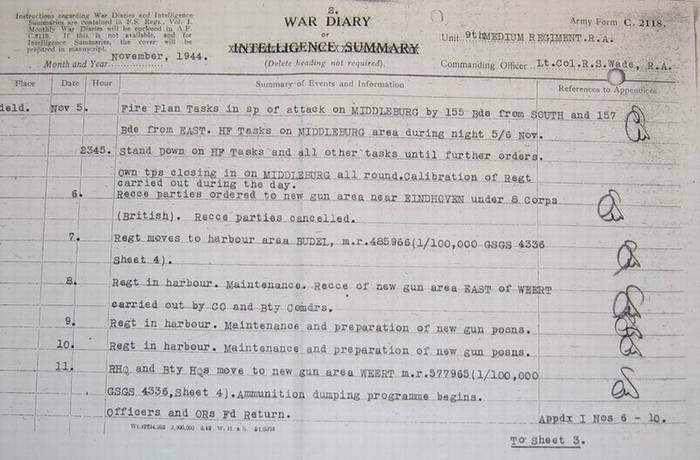 The 9th Medium Regiment’s War Diary is the only one that gave information about preparation of their fire in the Middelburg direction for the evening of the 5th of November 1944, but also mentioned that the firing was delayed. The Canadian CMHQ reports did not give any answer on Artillery activities, nor can I find an answer up to now at the PRO at Kew. I'm sure answers can be found in the Regiments Fire plans, in message logs of the Artillery regiments or an Infantry unit calling for the fire [as a result of a request from a F.o.o.]. Of course, as far as the fire plans did survive! 1) Which Regiments were involved with the Middelburg barrage? 2) How do I obtain the relevant plans? Up till now I have not been able to find any entrance to Regimental archives on the internet or Institutions that holds such fire plans etc. or any other relevant information. I have interviewed many people, in person as well as via the Internet, I have done research in regional archives as well as in Dutch relevant archives, and even given two radio interviews to ask for help but the results have been very poor. Some initial leads seemed promising, but further research didn't reveal any worthwhile information (the results were either demonstrably wrong or came from a blurred memory). There were some commitments to help too, but unfortunately no follow up! For health reasons I am unable to visit England for research on location, even if I knew where I could find answers to both questions. Which leaves me with only one option: to ask for help, e.g. by giving me information or internet addresses for the regiments I mentioned! I have been retired for a long time and I feel it is my duty to find out truth and details about the artillery fire as a part of the history of our liberation ànd as a tribute to the men who participated in it. I will give the results of my research to the academic Zeeuwse library and to the Zeeuws Archive as a help to future researchers. At this point, I'm obviously at a dead end. For the reasons stated above and after all the years of research I do not wish to leave the job unfinished though. I'm asking much, but I do hope you will give me a helping hand. I assure you that I very much appreciate any help you can give me! Jan H. Wigard, Van Kleffenslaan 60, 4334 HK Middelburg / Netherlands.